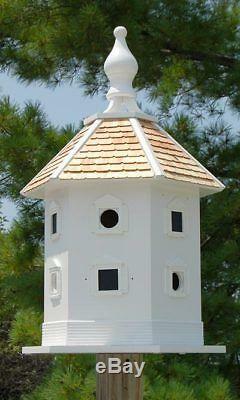 Add a powerful look to your bird garden with the Home Bazaar Danbury Dovecote Bird House. This significant roost mimics medieval shelters made for doves, with its hexagonal shape, extended body, and bold finial. These shelters, often owned by nobles, became a symbol of wealth and power, and this striking piece will certainly offer elegant and timeless style to your backyard. Each of the six openings leads to an apartment, for several bird families to roost at once. A 1.5 diameter entry on each side allows birds to enter the unit, and their alternating placement provides options for your feathered friends. A faux window shape on each side adds a balanced look, while shutter shapes flanking each opening and imitation window bring bold detail. Two ventilation holes on each compartment help regulate the internal temperature, assisted even more by the all wood construction. Drainage holes on the base help nests remain dry, and the house may be removed from this bottom platform for seasonal cleanings. The generous, pine shingled roof protects the home from the elements, while a robust, rounded finial completes the piece. Use the included, 6" x 6" mounting plate to display this item on a 4 x 4 post (not included), to beautify your backyard easily. Bring impressive and timeless style to your bird garden with this Danbury Dovecote Bird House. Climate and the elements will weather this house and change its appearance over time; however, weathering will add to the home's natural charm without compromising its function. Should you want to preserve the finish (paint) of this item, you should select a polyurethane product that is recommended for marine use (UV Rated) that will not turn the white paint yellow. You should expect that once left outside, the home will weather and require refinishing. 16.125"L x 18.5"W base, 30.25H. The item "DANBURY DOVECOTE BIRD HOUSE by HOME BAZAAR" is in sale since Tuesday, November 6, 2018. This item is in the category "Home & Garden\Yard, Garden & Outdoor Living\Bird & Wildlife Accessories\Birdhouses". The seller is "jea759" and is located in Nashville, Tennessee. This item can be shipped to United States.